Abraham Aaron was born in Lancaster County, Kentucky but removed to Pittsylvania County with his father where he resided a long while after the Revolutionary War. He was drafted for six months as a Militiaman in 1780 in the company of Captain William Witcher in Pittsylvania County. The troops marched to Salisbury, North arolina,, then to Camden. He was in the Battle of Stono when the Americans were victorious and captured a number of prisoners. Afterwards, he marched to various places throughout the countryside and finally back to Camden, after having served a full term. He resided in Greene County, Tennessee until 1824 before removing to Adair County, Kentucky. As so many others had done, after the war, new lands opened up for settlement and Abraham Aaron moved westward. The trail into Kentucky usually began in Virginia. A short while before the American Revolution, a vessel left Isle of Skye Scotland and dropped anchor outside of Wilmington, North Carolina. It was loaded with the MacDonald Clan; and particularly Flora MacDonald, a supporter of Bonnie Prince Charles (Stuart pretender to the throne). They sent a message to the Governor of the State asking for acreage upon with to settle the clan and waited to be granted several thousand acres in Moore County. At the beginning of the Revolutionary War, the Scots sided with Great Britain in the cause. One morning, the young Hugh McDonald, aged 16 years, while working alongside his father in the family field, saw a company of American patriots approaching on horseback. Not wanting to join the cause, the father ran into the woods to hide and while he was gone the patriots persuaded young Hugh to join up as a drummer boy. Shortly thereafter, the boy fought in the Battle of Moore's Creek Bridge, a minor but important victory for the patriots. For the next several years Hugh fought in all of the skirmishes and battles of his regiment which eventually led to the surrender at Yorktown of Cornwallis. In his pension, Hugh tells of a battle when he took a musket ball in the leg and fell to the ground. A British soldier, standing over him, sword in hand, prepared to kill him when suddenly he changed his mind and ran into the woods. That wounded leg would trouble Hugh all of his life. After the war, the MacDonald clan, having chosen the wrong side of the conflict, was compelled to return to Scotland. Meanwhile Hugh was entitled to a land grant for his service. 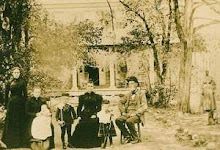 The land was in Elbert County, and that is how the family set their roots in Georgia. There are many such stories to be discovered in the records. Just about everybody descends from a brave soldier of the Revolutionary War, War of 1812, or the American Civil War. We read of the founders of this country and other heroes, yet we, too, have family members who risked everything to come to America, and take upon themselves the battle for freedom. Yet, in this age, young people are rioting in the streets, demanding, demanding, demanding. I wonder if they realize the sufferings of their own ancestors or have heard a story of their past? If so, then I expect that, instead of destroying property, they would want to help America now in its troubling times. For, it is during this era that we stand to lose our Constitutional freedoms and very life to domestic and foreign terrorists. Hugh had the right to bear arms, to save himself from invading armies, and his children served in local militias carrying weapons to further protect the countryside. So that has been the way of it from America's earliest times. One of of most precious freedoms, the right to keep and bear arms was described by Aristotle, Cicero, John Locke, Machiavelli, the English Whigs, and others. This heritage is our right as are the freedoms for which Hugh McDonald fought so long ago. Now, in the wake of terrorist attacks upon Paris, we are at a threshold of decision. Sit on our laurels and let Islam capture America, or fight. Veterans speak of World War II as "the big one". However, larger, more terrifying battles knock at our doors, and promise many long years of struggle. It is one which the spoiled children of the soldiers of the American Revolution and other wars do not understand. For they have been safe all these years. How can the mothers and fathers of these children change their hearts? If they knew their background, who they really are , they would begin to understand and appreciate so strong a love for our America. We can no longer depend upon the schools to teach a true history. Instead, the schools trash Thomas Jefferson, James Madison, George Washington, and even Columbus (1492). Toyko Rose of World War II is back, propagandizing, persuading the children to forget the founding fathers. To help us discover our roots, many genealogical records are being published online. It is joyful to piece together (from actual facts) the endearing stories of the past. May I invite you to join these websites and make good use of the records? Georgia Pioneers, Kentucky Pioneers, North Carolina Pioneers, South Carolina Pioneers, Virginia Pioneers and Southeastern Genealogy. Sources: North Carolina State Papers; Revolutionary War Pension of Hugh McDonald. Bullitt County was founded in 1796 and the county seat is Shepherdsville. It was named after the nephew of Thomas Bullitt, Governor Alexander Scott Bullitt, who served as the first Lieutenant Governor. The land was taken from Jefferson and Nelson counties through an act approved on December 13, 1796 by the Kentucky General Assembly. In 1811, the northwestern area of the county expanded to include land given by Jefferson County and in 1824 an eastern area of the county was given to help form Spencer County.